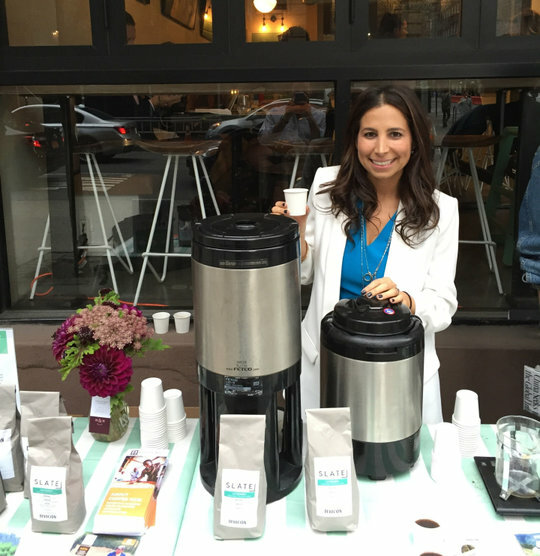 Our second feature in our Women’s History Month Series is Ashley Jaffe, the co-founder of Blank Slate Coffee + Kitchen, NYC’s cutest cafe located at 121 Madison Avenue! Ashley and her husband, Zach, strike the perfect mix with their upscale “coffeehouse” food, offering gourmet breakfast and lunch options as well as artisan coffee, craft beef and wine. Their food is known for adding a twist to your favorite, classic dishes and using fresh ingredients that makes their food as delicious as it is picturesque (see our Instagram where they are frequently featured)! We opened our first store, Blank Slate Coffee + Kitchen, in November 2015. I come from an extensive public relations background (specifically focusing on food & beverage) and had always wanted to take the leap into the operations side of the business. My husband had been operating bars and restaurants for years and was looking to open a new daytime concept. So we decided to partner up and open a café together! We set out to open a restaurant/coffee shop hybrid! We love coffee and great food and at the time, the concept really didn’t exist. We never understood why coffee shops were only offering soggy grab & go sandwiches. Customers should be able to get a great meal and a killer cup of coffee at the same place. So we set out to give them just that. I’ve learned the importance of a strong team that you can really trust. A business owner works so hard to ensure every last piece is perfectly in place, and then it’s up to the staff to execute those practices. Sometimes it’s great and other times a cashier just broke up with her boyfriend or is having a horrible day and is rude to every customer that walks in, which is not okay. I’ve learned the importance of extensive employee training and constant one-on-one conversations with each and every employee about the importance of customer service and quality work. As a business owner, you need to work endlessly to ensure that you have the right team that’s happy and proud to do good work for you. At the end of the day, your business is in their hands. I’ve seen the good and the bad of being a female-owned business. I’ve had not-so-nice people come in asking to speak with my husband, even after I’ve told them that I’m the co-owner of the business. But I’ve also seen so many people be extra supportive of our business because it’s female-owned. Wanting to shout us out on social media or order catering from us rather than a different restaurant simply because they want to support other women has been amazing to see! I think the mission is amazing – especially in the food business. Women and minorities make up the majority of our team and we wouldn’t be where we are today without them! It’s so important to give these groups a voice and it’s incredible that a company in this space has recognized that. Go for it! I promise you- you will be more pleasantly surprised by the support that comes your way than the obstacles that you think you may face. The future is most definitely female!